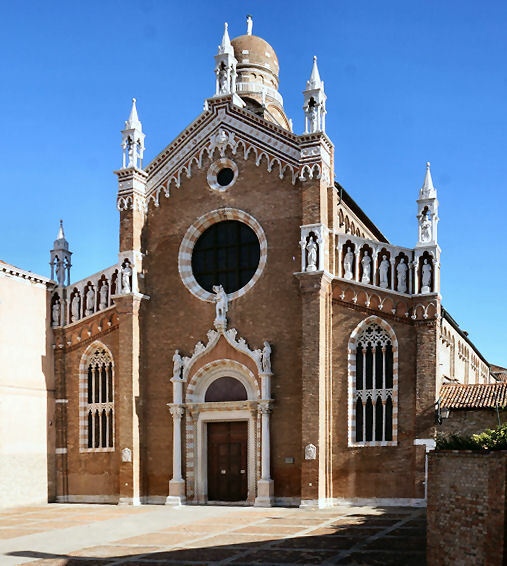 A church and monastery were founded here around 1350 by the Umiliati order from Lombardy and initially dedicated to Saint Christopher, the patron saint of the gondoliers. Fra Tiberio of Parma, the leader of the Order, is said to have been responsible for the original design of the church and is buried here. During the building of this church an unfinished statue of the Madonna, made by Giovanni de Santis (but also said to have fallen from heaven) and kept in an orchard (orto) nearby following its rejection by the Prior of Santa Maria Formosa, for which church it had been carved, started getting a reputation for glowing and working miracles. The Scuola di San Cristoforo bought the statue, with the intention of thereby increasing offerings towards the cost of the building work, and on 18th June 1377 it was placed on the high altar. Since then the church has been known as Madonna dell'Orto. After a serious subsidence in the foundations at the North end of the church the order were given 200 ducats to rebuild. Reconstruction work from 1399 resulted in the complete redecoration of the interior and the construction of the new façade. A new and larger monastery was built at this time too. The Umiliati were expelled 1461 by the Council of Ten because of their licentious habits, the suppression of the order by Pius V following in 1571. The Canons of San Giorgio in Alga (also known as the Turchini (or celestini) because of their blue robes) replaced them, and the restoration work was finished in 1473 with the completion of the façade. In 1669 Cistercians from San Tommaso on Torcello moved here, the Canons of San Giorgio having been suppressed by Pope Clement IX. 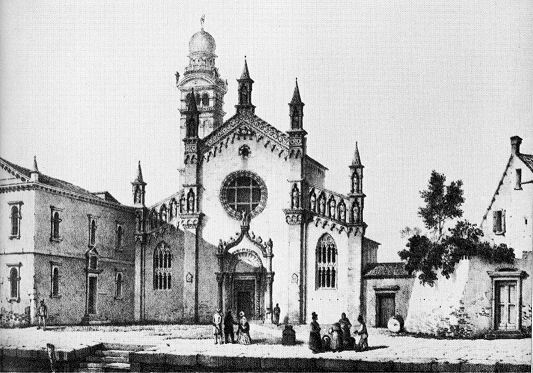 In 1787, with only three monks living here, the Republic acquired the church and it was administered by the parish priest of San Marziale as an oratory. The church was allowed to crumble, with buildings being pressed into use as a stables, a hay and wine store and a powder magazine, until 1841 when some poor restoration (which included ripping up memorial stones, destroying the already damaged ceiling paintings, plastering over the façade and destroying the organ) was carried out under Austrian rule. It closed in 1855 but, after spending some time being used as stables, it was reconsecrated and reopened in 1868 as a parish church. (See H.Taine said below.) 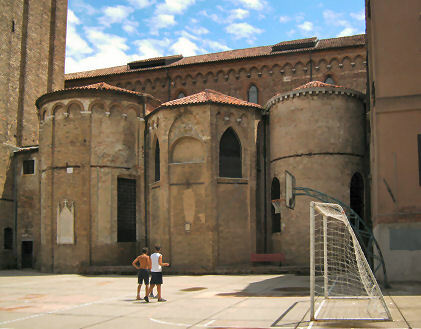 In 1931 the complex was given to the monks of San Giuseppini del Murialdo, who still administer it. More restoration work was carried out in 1912 and in 1930-1931, when the 19th century interventions where reversed. But the great acqua alta of 1966 damaged the church further. 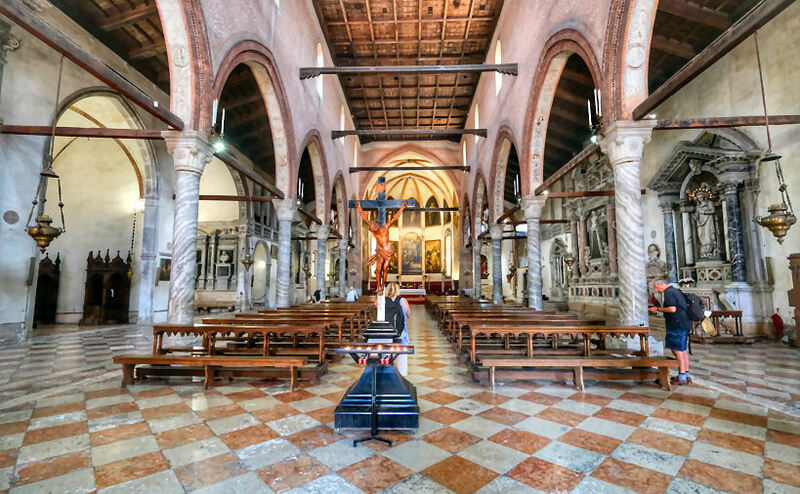 Following this flood the church and its paintings were thoroughly restored by Venice in Peril between 1970 and 1980. 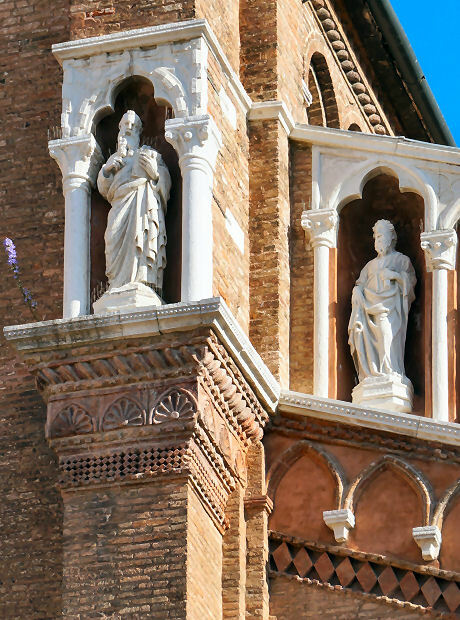 The gothic brick façade is one of Venice's most purely pleasing. The sloping galleries of apostles, carved by the Delle Masegne brothers, are unique in Venice. (The herring-bone patterned brick pavement is a pretty rare survival too). The façade went up in the early 15th century, with the side windows added a little later, and then the door case. This doorway, by Bartolomeo Bon, whose workshop was nearby in San Marziale, features a gothic ogee arch with a renaissance rounded arch underneath. This stylistic mixture might be explained by the fact that the doorway was begun in the 1460s, but not installed until 1483, twenty years after Bon's death. So it's possible the rounded arch was added to spice up the, by then, unfashionably gothic doorway. The ogee arch is surmounted by a statue of Saint Christopher, with the Virgin and The Angel of the Annunciation on either side. These statues were taken from the 14th century church, the Saint Christopher by Bon, and the Virgin and the Angel by Antonio Rizzo. Rows of columns of lovely striped Turkish marble separate the nave from the aisles, with archaic capitals, retained from the original church. Three chapels each side. Timber tie beams and a flat coffered timber ceiling. From 1547 this was the parish church of Jacopo Tintoretto and his family - they moved to the nearby Fondamenta dei Mori from near San Cassiano in that year. His ashes were interred here in the 19th century, along with those of his wife and eight more family members. You'll find his memorial stone in the chapel to the right of the chancel, which was previously the chapel of the Bonetti family, including painters Marietta and Domenico. There are 11 paintings by him here - only San Rocco beats this church for feasting on Tintoretto. A monumental pair, The Adoration of the Golden Calf and The Last Judgement both thought to have been painted around 1563, flank the altar, fitting exactly into their spaces, they were probably painted in situ. (It is said that amongst the bearers of the Golden Calf you'll find portraits of Giorgione, Titian, Veronese and Tintoretto himself.) The Five Virtues in the vault are by Tintoretto too, except the middle one, Faith, which is visibly by a different (17th century) artist, Pietro Ricchi from Lucca. The Presentation of the Virgin (see right) over the door to the Capella di San Mauro, is from a few years later and is more lovable. (Note the real gold leaf decoration on the steps.) It was painted to outdo Titian's huge painting of the same subject (in the Accademia) and even emulates the older artist's characteristic colour scheme. Tintoretto had last a mere ten days as Titian's pupil, for whatever reason, and they never became pals. The very-evident obelisk is also a steal from the Titian, but is also a not-unusual inclusion in paintings of this subject of this period, representing the sun and symbolising the triumph over death. 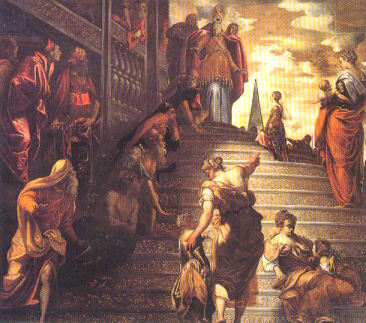 The 15 steps represent the 15 psalms recited by pilgrims ascending to Jerusalem. This painting was once the outer doors of the organ, with the two paintings currently either side of the high altarpiece The Beheading of St Paul and The Vision of the Cross to St Paul on the inside of the doors. The left-hand side of the church is dominated by works by Tintoretto's son Domenico which don't exactly shine and, in fact, a Palma Giovane Crucifixion in the Morosoni Chapel is the highlight of this side. 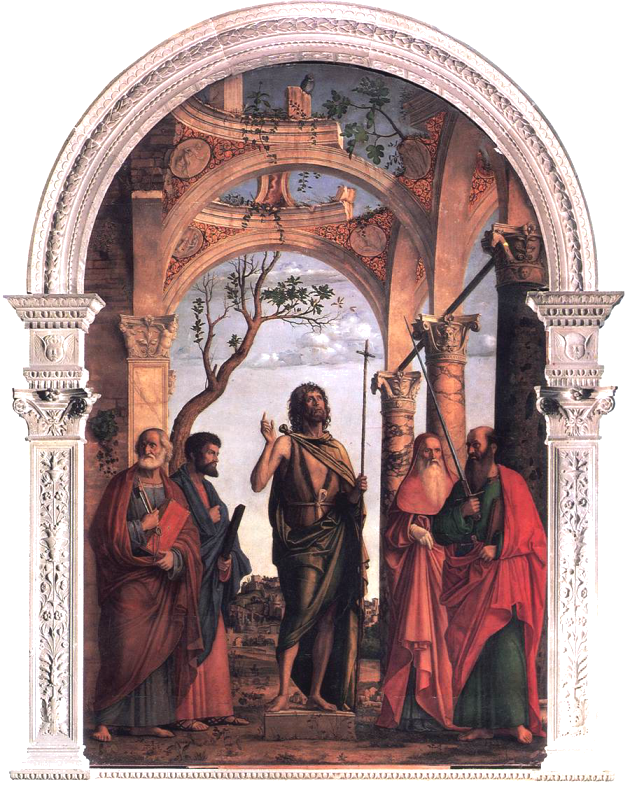 In the first chapel on the right Cima de Conegliano’s fine Saint John the Baptist with Saints Peter, Mark, Jerome and Paul of 1493-5 (see below right) which is rare for being in its original frame and over its original altar, with Saint John looking for enlightenment towards the church's window. It glows after its 1999 restoration, and is one of his best. Titian's Tobias and the Angel was moved here from the nearby church of San Marziale, presumably because it's a less visited church. Also a couple of impressive works by Matteo Ponzone. His Saints George, Jerome and Tryphon came here, from the church of the Knights of Malta, to replace Bellini's painting of Lorenzo Giustiniani, on the Renier altar, mentioned below in Lost art. Even the Palma Giovane Annunciation is one of his more original compositions. The miracle-working statue of the Madonna, much restored with plaster, is in the Capella di San Mauro, along with twenty-eight portraits of Venetian saints and beatified persons, painted by various artists in the 17th century. In here is also a modern portrait of San Leonardo Murialdo, the founder of the order which has run this church since 1931. 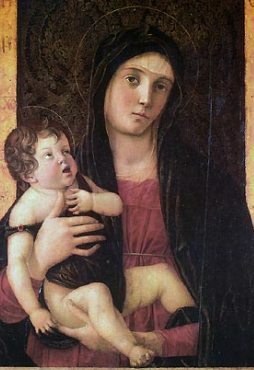 In the first chapel on the left is a colour photograph of Giovanni Bellini's small panel painting of the Madonna and Child (1480) (see right). The painting was stolen (for the third time) from the church on 1st March 1993, having been restored in 1969 following its previous theft. A guidebook written just before the most recent theft comments that the Child's hair was 'specially pretty'. Hare's guidebook of 1904 says that the Madonna's head is the 'only beautiful part of this picture'. It had a background of gilt leather and had been commissioned (or possibly 'bought from stock') by Luca Navagero, the Venetian vice-regent for Friuli, for his tomb elsewhere in the church. Pordenone's The Blessed Lorenzo Giustiniani with Two Canons and Saints was painted for the altar of the Renier family, where it remained until Napoleon took it in 1797. It's now in the Accademia, to which it was returned in 1815. Also in the Accademia is the earlier (but still posthumous) The Blessed Lorenzo Giustiniani of 1465 by Gentile Bellini, which was used to replace the Pordenone just mentioned when it was taken by Napoleon. 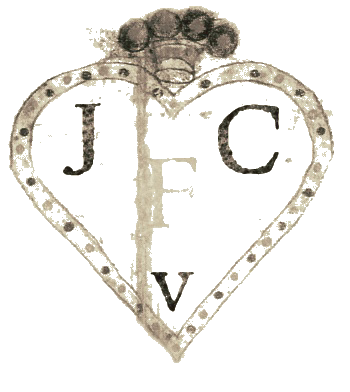 Lorenzo Giustiniani, was one of the group of brothers who formed the congregation of the canons of San Giorgio in Alga, the order which took over the Madonna dell'Orto in 1462. He was also, in 1451, made the first patriarch of Venice and later got as close to sainthood as any Venetian from this period, attaining the status of beato in 1690. A rather good Sacra Conversazione by Bonifacio de'Pitati in the Palazzo Pitti in Florence 'probably' came from here. Erected 1332, rebuilt with the addition of a belfry in 1503, with a statue of the redeemer on top of the oriental-looking onion dome and apostles perched on the edges, all by the Lombardo workshop. Restored in 1819 following a storm. The bells were replaced in 1883. 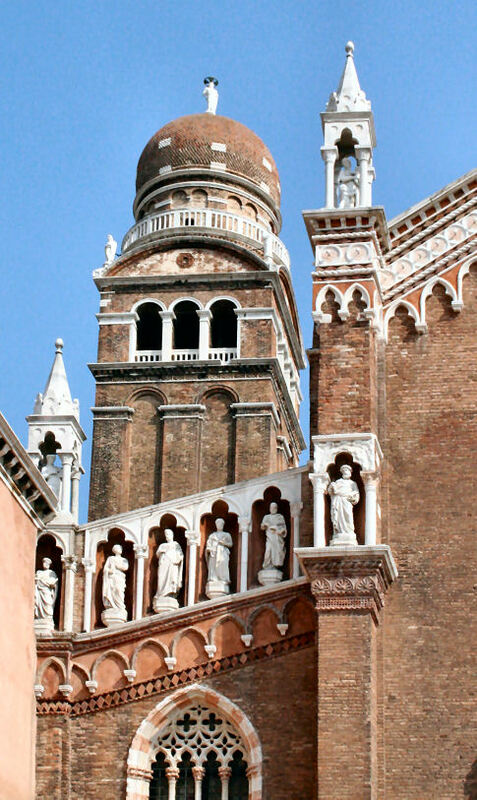 Donna Leon's Commissario Brunetti in the novel The Girl of His Dreams looks up at the church: 'The brick dome of the bell tower had always looked like a panettone to him, and so it did now.' The same book also reveals that Brunetti was on his holidays when the Bellini (mentioned above) was stolen, and that by the time he returned to work the art-crime squad from Rome had given up and gone home. An important scene in Time's Betrayal by David Adams Cleveland plays out here, in the first chapel on the left, in front of the Bellini Madonna and Child, before its most recent theft. My walk today is to Santa-Maria dell Orto to see Tintoretto's great paintings of The Worship of the Golden Calf and The Last Judgement. I find the church closed and the pictures rolled up and taken away nobody knows where. The edifice seems to be abandoned. 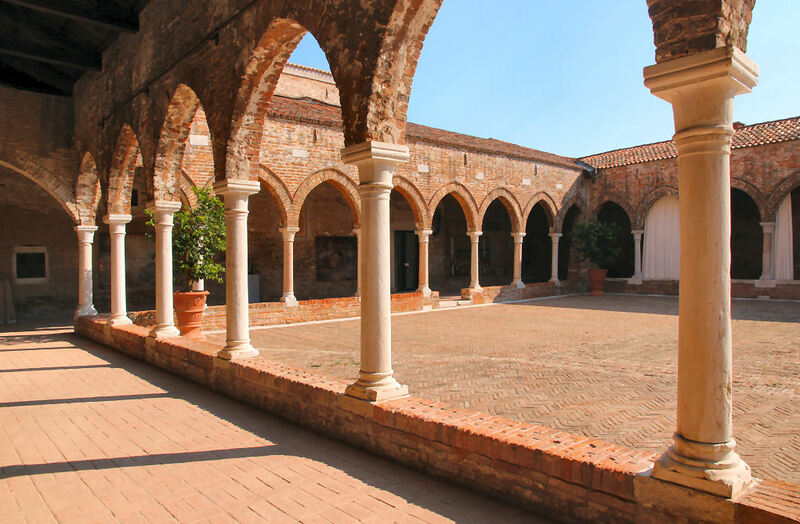 On one side is a dilapidated cloister broken open and serving as a lumber-yard, with the grass growing fresh and green along the arcades. This is one of my greatest disappointments in Venice. Everything you ever wanted to know about the Venice in Peril restoration work, with lots of black and white before and after photos of blackened statues, crumbling cloisters and paintings in the process of restoration. A CD-sized guide booklet available in bookshops in Venice. Not sure who wrote it, as it has an editor and a translator only, but it does its job.